We’re all about the tooth fairy in our house these days. Dori lost six teeth in the past year or so, and her mouth is a jumble of gaps, emerging teeth and a general orthodontic nightmare. But the fun in having kids is being the tooth fairy (I hope she doesn’t read my blog). She claims to believe in the tooth fairy even though she told her friend quite loudly while I was in the next room, that she saw me bring the money in for tooth #5. She added that she knows there’s no tooth fairy, but she fakes it so she can get the money. Smart girl. Of course for tooth #2 she fully believed. So much so that when the tooth fell down the drain as she washed the blood off it, she cried and cried. We sent her downstairs to calm down, while I quickly retrieved her first tooth from my sock drawer. Daddy looked like a hero, as he “pulled” it from the drain. Our adoring daughter has no idea how unhandy her father really is with plumbing. Which brings me to two fun tooth fairy books (aside from Throw Your Tooth on the Roof, which I reviewed earlier – read that one here). The first, You Think It’s Easy Being the Tooth Fairy? I reviewed for Family Fun Magazine (and it’s out this month). But I’ll say that the lovely and talented Sheri Bell-Rehwoldt wrote an adorable book, aptly illustrated by David Slonim. The cute little tooth fairy is bug sized, with a mop of red hair. She’s tough, action oriented, inventive and she has a sense of humor. She’s no Cinderella, as she says herself. 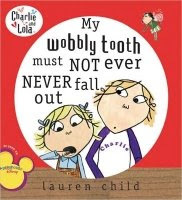 The other book I like is My Wobbly Tooth Must Not Ever Never Fall Out (that’s a mouthful) by Lauren Child. Totally different book than the other two. Here, Lola has a wiggly tooth that she wants to keep until she realizes that she’ll get money for it, enough money to buy a giraffe for her toy farm. That tooth comes out pretty quickly after that (and like Dori, she loses the tooth after losing it, if you get what I mean, but the tooth fairy comes anyway).